There is no rule that says Amish-made furniture has to look old-fashioned or antique. If you prefer furniture with a more modern look, then our collection of solid wood Amish Contemporary Hutches will surely capture your attention. 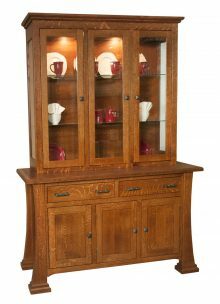 Whether you select the Acadia Hutch, Bellevue Hutch, Christy Enclosed Hutch, Woodside Harvest Hutch or any of the dozens of other remarkable pieces in our collection, you are assured of adding a touch of contemporary style and grace to your dining room. 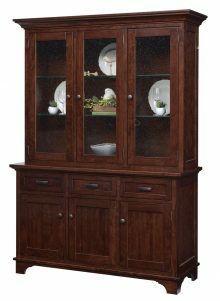 Whether you select the Acadia Hutch, Bellevue Hutch, Christy Enclosed Hutch, Woodside Harvest Hutch or any of the dozens of other remarkable pieces in our collection, you are assured of adding a touch of contemporary style and grace to your dining room. Like most Amish furniture, our Contemporary Hutches are destined to become treasured family heirlooms, passed down from one generation to the next. Choose from attractive, sturdy northern kiln-dried hardwoods such as cherry, rustic cherry, oak and maple materials that are renowned for their longevity. 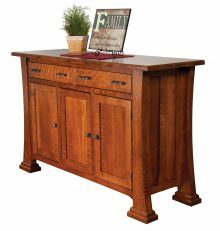 Our location in the heart of Ohio Amish country gives us access to some of the finest Amish furniture makers on the planet. We don’t sell cheap, mass-produced furniture that fails to stand the test of time. We make Amish furniture to suit every taste. Our contemporary hutches include options that will complement any kitchen or dining room, offering you the storage space you need for your dishes and silverware while also featuring an attractive display space where you can show off your most treasured items. But with so many choices, it can be difficult to narrow your choices to just one! Do you want lighting in your hutch? 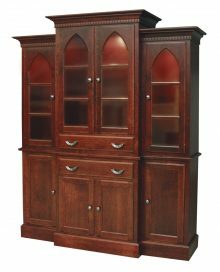 We have beautiful options, such as the Renaissance Hutch and Pasadena Hutch, that cast soft light on your most prized possessions. How much display space do you need? The Bradly Mini Hutch is smaller and has less display space, but still offers a whole lot of storage. We have options including two, three and four doors, as well as a few hutches, such as the Caledonia Hutch in Oak, that feature drawers instead of doors. We offer hutches that can fit into even the tiniest of rooms without sucking up space, such as the narrow Lexington Hutch or the Savanah Hutch. Don’t limit the display area to storing extra utensils, bowls or plates. Instead, infuse your hutch with your personality by putting an array of family knickknacks, including souvenirs from family trips and family photos, out for everyone to see. The gorgeous wood in our Amish contemporary hutches will make great decorating material. Buy new frames in a grain that matches your new hutch, or pick out candlesticks made from the same type of wood. 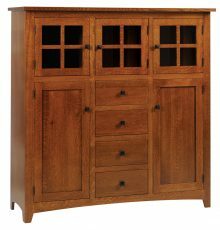 A bolder way to connect everything in the room would be to buy other AmishOutletStore.com furniture that matches your new hutch. We have a selection that includes a number of kitchen and dining room options, perfect for giving your room a fresh look. 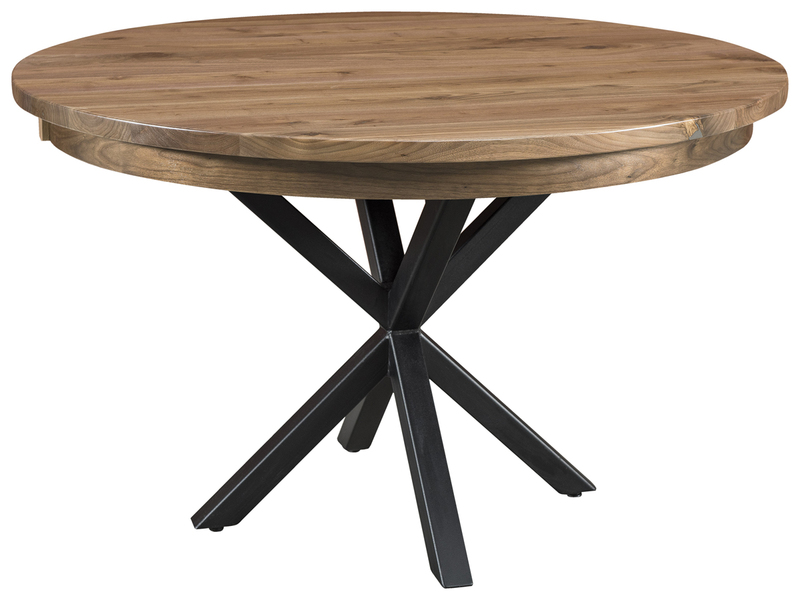 If you have modern styling but value the great construction that comes with an Amish piece, you’ll like our furniture’s longevity. Your new hutch will stay busy storing plates, displaying knickknacks and holding anything else you need it to. But don’t worry — even with this sustained use, our hutches will remain in good shape. We use the highest-quality materials to construct these sturdy-yet-stylish hutches that stand up to everyday use. Buying furniture is a big decision for any homeowner. Our wide range of money-saving discounts will allow you to make your purchase with a high level of confidence. 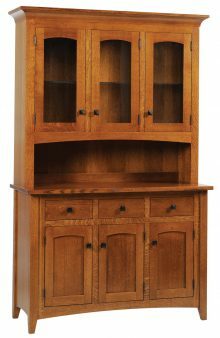 Purchase any contemporary hutch right now and get up to 33% off the regular retail price. You can also save up to an additional 13% by taking advantage of our large-order discount. What’s more, you’ll get 3% off just for paying by check. Take a look at our entire collection of solid wood Amish Contemporary Hutches right now!